It can be a bit of a challenge deciding which piano to buy when you’re first starting out. Roland have an excellent reputation for building quality instruments. Importantly, they also have a few digital pianos for under $1000. 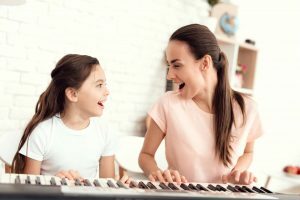 There are countless apps available that are designed to help you learn to play piano, no matter what level you’re playing at! Before going into a piano shop, it’s good to have a pretty clear idea of what you’re looking for. With that in mind, let’s take a look at Roland’s pianos for under $1000, which have set the standard for digital pianos in this price range. Digital pianos under $1000 – Impressive sounds and features! If you’re looking for a fun and inspiring way to start playing music, a quality instrument such as Roland’s GO:KEYS is just what you are looking for! Easy to learn with a ton of great features and a huge range of professional sounds, you will be able to enjoy making music from the very start! With its innovative Loop Mix function, you can build fully produced songs right away, even with no previous music experience. There’s also an easy-to-use recorder to capture and share your creations. And with Bluetooth® connectivity, you can jam along with music from your smartphone or tablet and work with all sorts of great music apps. Compact and battery powered, GO:KEYS also lets you enjoy the magic of musical creativity everywhere you go. When you’re learning to play the piano, having 88 keys makes a big difference. Although smaller 61 or 76-note keyboards are portable and easy to handle for younger players, an 88-note full-size keyboard helps you develop the correct technique and therefore become a more expressive player. Most keyboards make you choose between performance and portability. Importantly, Roland’s GO:PIANO88 delivers equally on both fronts. Lightweight and road-ready, with optional battery power and headphones, this mobile instrument has a full-size 88-note keyboard. Its sounds are derived from Roland’s best digital pianos, so you can play with the correct technique and expression – vital for complex pieces such as classical music. When inspiration strikes, take a seat at the latest model in Roland’s renowned FP piano series; the entry-level FP-10. This affordable digital piano is always ready to play. It has an authentic feel from the 88-note PHA-4 Standard keyboard, joined by Roland’s evocative SuperNATURAL piano tones through onboard speakers or headphones. With its portable, space-saving design, the FP-10 is the ideal instrument for home use. It is suited to practicing techniques in the spare room and giving performances in the living room. Plus, with Bluetooth® connectivity and powerful onboard features not offered by any other digital piano under $1000, the FP-10 is the ideal second piano for more experienced players. Our piano takes pride of place in our living room. Coming home to the sounds of someone playing always brings a smile to my face! It’s one of those things, like the smell of home cooked bread in the oven, that really turns a house into a home. Above all, it has opened up a lifetime of enjoyment to my children. I hope that this short guide has given you the inspiration and direction needed to take the next step! There is no time like the present to begin your musical journey.